‘Crime corridors’ have been created along the border, Noel Cunningham said today. A SIGNIFICANT INCREASE in the number of Gardaí assigned to the border will be needed in light of Brexit, the president of the organisation that represents senior Garda officers said this morning. 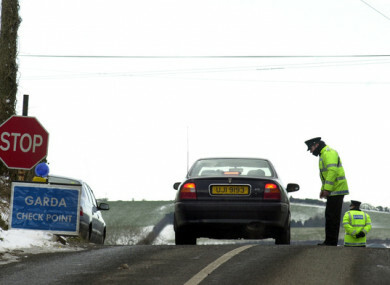 Speaking on RTÉ Radio 1′s Morning Ireland, Noel Cunningham, President of the Association of Garda Superintendents, said that “crime corridors” had been created along the border with Northern Ireland in recent years. The number of police in the area had fallen as a result of the peace process, he said, and rates of ordinary crime had risen as a result. This, combined with the potential for a hard border or for different customs rules to exist in Ireland and Northern Ireland after the UK leaves the EU, means there’ll be a greated demand on garda resources, he said. We shouldn’t have a knee-jerk reaction when it does happen next year. We’re simply preparing. Any strain on resources created by Brexit will affect the whole country, he said. While the specifics of how the border will work after Brexit are not yet known, Cunningham is calling for a review into what the implications may be for crime and policing. “A bit of strategic planning, a bit of pre-planning, will make sure the proper resources are in the proper places. We need a piece of work to look at what the implications may be and decide what exactly is needed. Do we need what we had during the Troubles or will we be able to do with less because of the technology that’s avalailble to us? The opening of the border, while welcome, has made it “easier for criminals to move forward and back,” Cunningham said. Rates of so-called “ordinary crime”, such as burglaries, have increased “exponentially” in the past 15 to 20 years, he claimed. “There would have been no ordinary crime in the 1980s. We would have been dealing with the terrorist campaign. Now we have criminals coming from Belfast, we have criminals coming from both North and South of the border, we have criminals from Dublin, and they’re using the lower numbers of policing members on the border. They’re taking advantage of that situation. The annual conference of the Association of Garda Superintendents takes place today in Naas, Co. Kildare. This article was updated at 11.06am. Email “We'll need a big increase in Garda numbers at the border after Brexit, senior gardaí say ”. Feedback on “We'll need a big increase in Garda numbers at the border after Brexit, senior gardaí say ”.